Suburbia is a surreal experience when your usually based in the city 24/7. The panorama above highlights the quiet estates which are typical of 80’s newbuild in the United Kingdom. 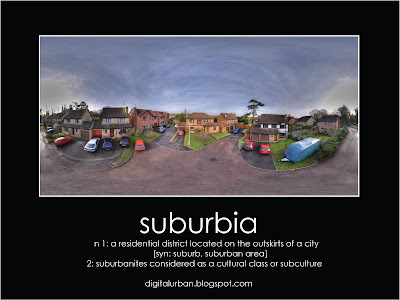 Click the image to view a larger version, view suburbia in Quicktime virtual reality (2.9Mb)or view via the digitalurban flickr group, simply login or set up a Flickr account and click here to join the DigitalUrban Group. It was taken using a 6 metre pole, and some elastic bands/eraser to keep the camera auto capturing. Its not perfect as at that height the camera is all over the place, but it does provide a good view..